The candidate has taken to maligning opponents’ motives—but 57% of voters don’t trust her. Hillary Clinton has foolishly begun mimicking Mr. Obama’s practice of impugning the motives of political opponents, as her lead in the polls shrinks and perceptions that she is untrustworthy and out of touch with ordinary people grow. “Republicans are systematically trying to stop millions of American citizens from voting,” she tweeted last week, a reference to GOP efforts to pass state voter ID laws. These laws, which require people to present photo identification at their polling places, are clearly designed to protect the integrity of the ballot. Democrats claim that these laws suppress minority voters, but a 2012 analysis by Reuters showed that after Georgia’s voter ID law went into effect in 2006, black turnout increased four percentage points in 2008 compared with 2004, and seven percentage points in 2010 compared with 2006. In a June speech she accused Republicans of orchestrating “a sweeping effort to disempower and disenfranchise people of color, poor people and young people.” She then called out Govs. Jeb Bush, Chris Christie, Rick Perry and Scott Walker for supporting election-law reforms and for periodically removing dead people and felons from registration rolls. Oddly, she made these remarks in Texas, which has a relatively lax absentee voting law and nearly two weeks of no-excuse early voting. New York, where Mrs. Clinton was twice elected to the U.S. Senate, does not allow early voting at all and only offers absentee ballots to those physically unable, for one reason or another, to go to the polls. Perhaps Mrs. Clinton thinks New York’s sitting Democratic governor is part of the nefarious “sweeping effort” to disenfranchise voters. Mrs. Clinton employs smear techniques on other topics, too. In a July 31 speech to the Urban League, she accused Mr. Bush of favoring “phasing out Medicare.” Of course, he supports no such thing. Instead, the former Florida governor proposes reforming Medicare by using ideas advanced in the late 1990s by the National Bipartisan Commission on the Future of Medicare. On Tuesday, Mrs. Clinton said that Mr. Walker “seems to be delighted in slashing the investment of higher education.” There’s no evidence Mr. Walker delighted in it at all. As he pointed out, however, he did freeze in-state tuition four years in a row, which could earn him points among younger voters. Mrs. Clinton has an ally in making these charges, namely a compliant media that does not challenge her characterizations. Imagine the outrage if a Republican candidate alleged that Mrs. Clinton seems to delight in slashing spending on embassy security, for example. She launched these attacks as polls showed her faring badly against GOP contenders. A July 20 Quinnipiac poll has her losing to Govs. Bush, Walker and Sen. Marco Rubio in the swing states of Colorado, Iowa and Virginia. A survey released this week from Public Policy Polling, a Democratic firm, shows her losing in Iowa to Mr. Walker, Mr. Rubio, Ben Carson and Gov. Mike Huckabee. 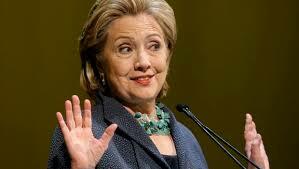 Knowing she is likely to face a tough general election, Mrs. Clinton will continue this character assassination. In response, Republicans should set the record straight and describe their policies. Then they should pivot to the offense by depicting her as standing for the liberal status quo. Already 57% of voters say Mrs. Clinton is “not honest and trustworthy,” according to the July 28 Quinnipiac poll. Such counterpunches will weaken her further and keep Republicans from turning on each other. What’s not to like about that?